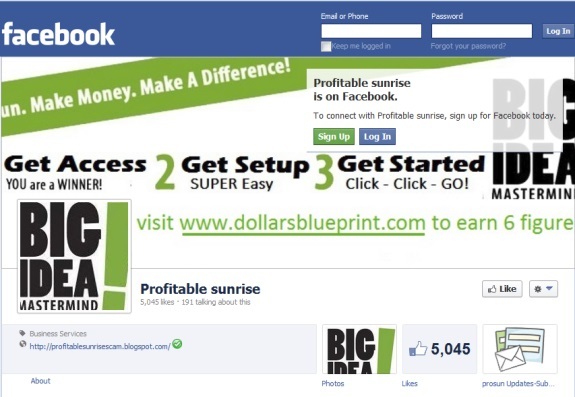 “DollarsBluePrint” now is being promoted in a big way at a Profitable Sunrise Facebook site. A Facebook site set up to promote the Profitable Sunrise HYIP scheme has changed the lead graphic on the page to drive traffic to a site known as “DollarsBluePrint” — apparently through a web entity known as “Big Idea Mastermind.” The previous lead graphic was a leftover from the fraud reign of Profitable Sunrise. The Profitable Sunrise Facebook site has 5,045 likes as of this morning. The SEC has described Profitable Sunrise as an exceptionally murky enterprise that gathered money through multiple other enterprises and may have collected tens of millions of dollars. The website of ProfitableSunrise went offline March 14 or thereabouts. In 2010, FINRA issued a warning on HYIP fraud schemes, saying they often trade through social-media sites. A series of reload scams have been promoted at the Profitable Sunrise Facebook site. In addition to DollarsBluePrint, today’s entries include “Hourly Chic Pay” (again). “YOU are a WINNER,” it screams. The website of Biwako Bank Limited also has triggered browser security warnings. Promos for TelexFree have claimed a person can pay the purported opportunity $15,125 and receive at least $1,100 a week for a year. Lesser incomes can be bought for lesser sums, according to the TelexFree promos. All such proof are easily manufactured. Found one such scam even created scam-busting websites that “approve” of their own opportunity, as “security audit” company that authenticated their own company, and review website that sang praises of their company, and of course, (whatever)scam websites that said whatever was not a scam, of course. Scammers create/fake their own social proof that their scam was not a scam. And they’ll even certify themselves as not a scam. The DollarsBluePring URL still appears to be redirecting to the BigIdeaMastermind site. Quick note: It appears as though yesterday’s graphic has been removed from the Profitable Sunrise Facebook site. I’m not sure why the “504 Gateway Time-out[:] BlockDOS” message is appearing. The Profitable Sunrise Facebook page is not owned by nor does it have anything to do with PS. Big Idea Mastermind is a basically marketing group that is used to promote another viable business model and neither of these have anything to do with Profitable Sunrise. Having this facebook page is just a way of getting traffic. People look for profitable sunrise information on google, they find a facebook page(because facebook has high page rank authority and will show up high in the search engine rankings), and then will think that what is on the page has something to do with PS? Anyhow, hope that clears some of it up. Oh and the image on the header is the same result you get when you try and go to the profitable sunrise website. Chris: The Profitable Sunrise Facebook page is not owned by nor does it have anything to do with PS. What does the ownership of a Facebook page have to do with the fact it was being used to promote an illegal HYIP ponzi which itself was the subject of 36 cease-and-desist notices and investor alerts ? What the hell does this Profitable Sunrise/Dollars Blue Print have to do with the Big Idea Mastermind? BIM promotes another online business opportunity and has absolutely nothing to do with this Profitable Sunrise HYIP ponzi scam. That looks shady. You all are using someone else’s logo to promote this Profitable Sunrise Dollars Blue Print ponzi scam. This is deceptive. Report them to Facebook and have their page removed. What you scummy bastards will do for a quick buck is sickening.